Today FotoInsight launches a new version of FotoInsight Designer with new lines of photo albums on photographic paper, new features like fading frames and festive templates and the addition of Linux and Mac OS versions. Cambridge, 20 August 2009. - Europe's most popular photo book software is now also available for Linux and Mac OS. 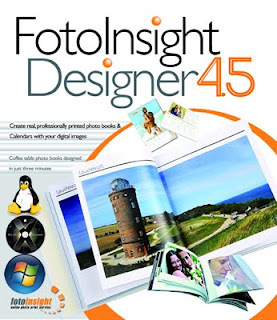 Against an ever growing number of photo book services, FotoInsight is increasing its technological lead with the introduction of version 4.5 of FotoInsight Designer. The application is available as a free download on the photo service's website and it can create a 130 page photo book lay-out in under three minutes. The new release of the order software adds photo albums processed on thick, lustre finish photographic paper pages. The new photo paper album styles ranging from 26 to 82 pages (in steps of eight pages) are only available in the FotoInsight Designer software. FotoInsight states that the book bulge in the new photo paper albums disappear, as the pages lay flat when the book is opened 180 degrees wide. A new binding process is being used for the album pages, which are thicker than pages in CEWE Photobooks. This allows the pages in an open photo paper album to lay flat, rather than bowing or arching up towards the spine. Flat pages make it easier to view images which spread across a double page. FotoInsight's Managing Director Klaas Brumann states: "The new printed photo album's thicker pages provide a premium feel over traditional coffee table style photo books. We expect the new photographic paper books to be popular with professional users and for wedding photo books!" - Photo Book Square (21 x 21 cm) from € 29.95 / £ 24.99. - Photo Book Large landscape, (28 x 21 cm). Compatible with Windows XP, Linux and Mac operating system 10.5 Leopard and above, version 4.5 of the FotoInsight Designer software is now available to download from the FotoInsight website. The software upgrade sees greater functionality for editing, sorting and arranging photos, as well as for creating personalised photo gifts that preserve photographic memories. According to FotoInsight: "layering images in any order or position has been one of the outstanding features of its Designer software for photo books. With the new software upgrade a range of different shapes or blend-in image masks can be used as image frames. There are also plenty of new frames and clipart to decorate photo gifts for Christmas, school, wedding and other themes. FotoInsight offers photo gift products to equip children in the new school year with notepads, animal key chains, messenger bags, aluminium water bottles and other product with own photographs. 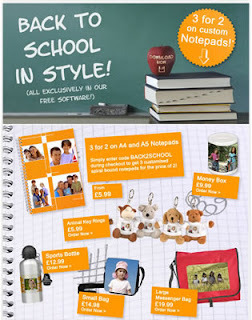 The firm is backing up it's back to school promotion with a three for the price of two offer on spiral bound photo notepads. The voucher code is BACK2SCHOOL (valid until 31 August 2009). FotoInsight Ltd was founded in Cambridge in 2003 and runs an easy to use digital photo processing service for Windows, Mac OS and Linux users, offering an extensive array of award-winning photographic print and photo gifts as well as the photo books, photo poster, photo calendars and photo canvas print. Prints ordered through FotoInsight are developed at five state of the art photo labs in three countries. The online photo service has grown year on year faster than the photo processing industry and has expanded its services in five European languages in 32 countries.